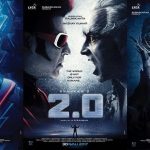 With the combination of Sun Pictures, Rajnikanth and Shankar, expectation are rising high. Now almost 85% of the film is over and shankar has started for the hunt of location for the next set of shooting. We met him with few questions about Rajni, grandeur and technology. This is the 1st film in Tamil which is coming as a science fiction movie. A scientist is creating a different robot. And the result whether its good thing, chaos and consequences is the result of the story. We are just quoting many films like it is similar to hollywood , i just want to create according to our culture, to be precise according to our place but this would be on par with holly wood quotes Shankar. If i say everything now, i guess that suspense will go off. 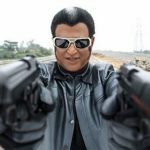 Whatsoever you people imagine you want ENTHIRAN film to be, it will be beyond your imagination, with much grandeur is the truth. Because this film has taken so much of work from us. You can see the effort which is to be taken for ten films in this one film. Rajni is such an amazing hero. Unlike other heroes who just come, just act in the shot and then get back to caravan. But Rajni sir will spend each and every minute with us he has taken so much efforts for this film. Just words can’t describe his efforts. It could be realised by all of you , when the film is released. You have tried to show Rajnikanth so young it seems? She is acting as a medical research student. 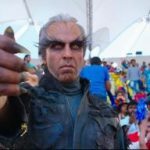 How the love starts between Rajnikanth and her,t hen how the story moves on , we dont want to discuss about these now.Lets talk about it later. One of the general fact is that graphics is generally given importance to ur film….how aboutt this film? Ya, its obvious in this.This is a story about robot so graphics is much needed in this. But you wont realise that its graphics when you watch this film. It would be so realistic. Before the fim started , we had started preparing everything before one and half years. That is like how people used to do in hollywood , what we are going to shoot and how we are going to shoot was decided on before hand. We have created enitre Enthiran film, in wat place if we keep graphics it would be good and many things we had almost made a big research. Then think about our efforts.Whats the regular practise is that people generally finish the film and come towards graphics department. But when shooting is on going, we had a graphics team by our side. One of the team will always stay with us. So that considerable amount of time will be saved. What have you done technically? Technically, we have handled a special thing called as ANIMATRONICS. In Jurrasic Park dinosaur’s movements are like walking, running. In King Kong, monkeys movements are the technical things which are done using it.This is new to tamil cinema. But don’t enquire whether this is going to be similar movie to that of hollywood. 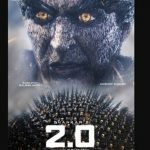 Since we have decided that we should not make anything similar to that of nature and we have tried something which is really new.When people see our Enthiran and i don’t want them to say that this is “SIMILAR TO THIS MOVE, SIMILAR TO THAT MOVIE” sort of thing. We are so clear in that stance. So everything will be new in this movie. Compared to SIVAJI film, all the locations will be different and the sets will make everyone dumbstruck and amazed. 3 SONGS have been completed shooting. “PUDHIYA MANIDHA BOOMIKU VAA DA ” is the lyrics of the title song which is penned down by vairamuthu. Generally i dont compromise for any of my film and this is no exception to my list. Since the story is about robot , some suggestions had been got from vairamuthu’s son who is specialised in robotics. He has also penned down one song. Generally after doing big budget film, you will do films like Kadhalan, Boys, etc. What happened now? Ya.I have changed my tend after SIVAJI film. This story is entirely different to me. The script has changed. We decided the budget. Whatever it had demanded , we have really justified it in the film. I havent decided anything regarding my next film. source a friend told me working in the ENTHIRAN MOVIE GRAPHICS DEPARTMENT………..
You Have Strocked All My Words Shiva.